This article was the basis for a talk on the 2014 election at Montgomery College Wednesday night. Professor Allan Lichtman has a wonderful predictive tool for presidential elections called the 13 Keys to the White House that he produced in various editions since he developed it decades ago. He has successfully predicted the winner of five presidential elections months and even years in advance, based on a century and a half of election results. Lichtman has developed no such tools for gubernatorial races, but some of the “keys” provide guidance for another way to look at why Larry Hogan Jr. won this year. “The keys are driven by a dominant idea: that the American electorate is pragmatic; it responds to the broad-based performance of the party in power, not just the condition of the economy,” Lichtman, a history professor at American University who lives in Bethesda, says in the book. Lichtman’s keys have not been widely embraced by pundits, political reporters and campaign consultants because they would put those folks out of business in explaining elections. Here is how Lichtman’s national keys that apply to Maryland’s election this year. The first has to do with picking up seats in Congress in the midterm elections. We have no such midterms, but the fact is Republicans picked up six seats in the Maryland House of Delegates in 2010 despite Gov. Martin O’Malley’s re-election, bringing it to an all-time high of 43 seats. In the 2012 redistricting, the governor and Democratic leadership conspired to make the GOP lose some of those seats by redrawing lines and packing incumbents into districts. Instead, this year Republicans picked up seven seats in the House and two in the Senate. Lt. Gov. Anthony Brown handily won his party’s nomination with 51% of the vote, but it was a long, hard-fought and expensive campaign. He was backed by all the major party figures, and had the overwhelming support of African American voters. But 49% of Democrats did not vote for him. Key 2: Brown was not the incumbent governor, always an edge for any Democrat. Key 4: There was a third party candidate to split voters against the incumbent Democrats, but the Libertarian candidate, Sean Quinn, got just 1.5% of the statewide vote, support that was more likely to have gone to Hogan if Quinn was not in the race. Keys 5 and 6 have to do with the health of the short-term and long-term economy. Here is where Hogan was both prescient and lucky. Go back three years and look at Maryland Reporter’s video of Hogan about his founding of Change Maryland and the accompanying article. Hogan’s message then, including the name of the organization that became even more resonant as the years went by, was about spending, taxes and their effect on the economy and jobs. It was the message that carried him to victory. Maryland suffered less than most states after the Great Recession, but coming into 2014 job growth was below the national average and unemployment was higher than the national average in a state that was not used to that. Key 7: The incumbent administration did make major changes in policy, but this was not a plus for Brown on health care, guns or taxes. Keys 8 and 9: There was no real social unrest or significant scandals during the O’Malley years that involved the top of the administration. There was the failure of the health benefit exchange brought up against Brown in both the primary and general election. The major problems at the Baltimore City jail, where the inmates were running the institution, were barely mentioned. Keys 10 and 11 are irrelevant to a state race since they relate to foreign and military success or failure. Anthony Brown didn’t come even close, and was widely faulted for his failure to excite or to make emotional connection with voters. His “30 years” of service in the military should have been impressive, and the Brown campaign even ran an ad about the bronze star medal he was awarded in Iraq. Brown was the highest elected official in the United States to have served in Iraq, but it was never really clear what Brown did in Iraq as part of a civil affairs unit, other than offer legal advice. The Bronze Star he got did not have the little “V” on it indicating he won it for valor in combat, though any service in Iraq was dangerous. There were 38,000 bronze stars awarded in Iraq. Larry Hogan could hardly be described as charismatic, but he always seemed genuine, affable, approachable, and he could excite a crowd with his Change Maryland message. Here is how some of these keys affected the outcome of the race. 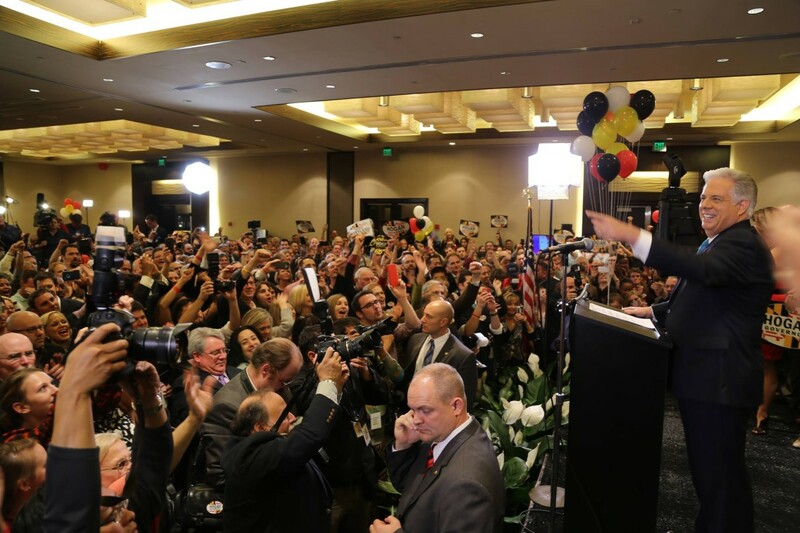 To win, Hogan had to get his Republican voters excited and out to vote. Likely, half of independents voted for him, and he peeled away perhaps as much as 25% of Democrats. To win, Brown simply had to turn out the votes of Democrats and particularly African Americans in three large jurisdictions: Montgomery County, Prince George’s County and Baltimore City. Yet those three jurisdictions had the lowest turnout of all 24 jurisdictions in the state. Their turnout was 6, 7 and 9 percentage points below the statewide average of 45%. The jurisdictions Hogan carried big all had turnouts substantially larger than the statewide average. In the six largest jurisdictions — adding Anne Arundel, Baltimore and Howard counties to the three already mentioned — Hogan did only slightly better than Bob Ehrlich did in 2010 in his rematch against Martin O’Malley, but Brown did much, much worse. Hogan won Baltimore County by 52,000 votes and he won Anne Arundel County, his home county, by over 61,000 votes, almost his entire margin of victory in the state, which was just 65,000 votes.